Carol has worked in the quality management, process improvement and major project management areas for the last ten years, latterly as a consultant. Before that, she spent 15 years working in sales, marketing and customer relationship management. During this time she mixed hands-on management with strategic advisory roles. 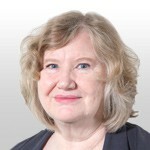 Carol’s long and successful career in the UK Post Office covered roles such as major account management in the aggressively competitive parcels market and the development and implementation of Business Excellence programmes in various parts of the organisation. She played a major part in the review of the size, structure and role of the corporate headquarters and project managed the introduction of a major new service into the Post Office Counters network of over 15000 outlets. Carol has worked directly with the European Foundation for Quality Management (EFQM) on a European wide strategic benchmarking project. She also has experience as an Assessor and Senior Assessor for various regional quality awards.